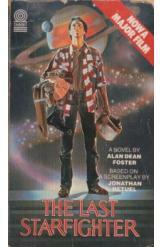 The Last Starfighter by Alan Dean Foster, based on the screenplay by Jonathan Betuel, Sci Fi. Alex Rogan masters a video game called "The Last Starfighter," and learns that it was designed by aliens to train humans to serve in their military. Now, the fate of the galaxy rests in his hands.